The Club welcomes new players of all abilities so if you are interested in finding out what we are about and getting into hockey please pop along to Club training and speak to one of our coaches. Spalding prides itself on being a friendly, family orientated club so we always look forward to meeting new people! We would also like to hear from umpires, coaches and anyone who would like to get involved with the club in a volunteer role. 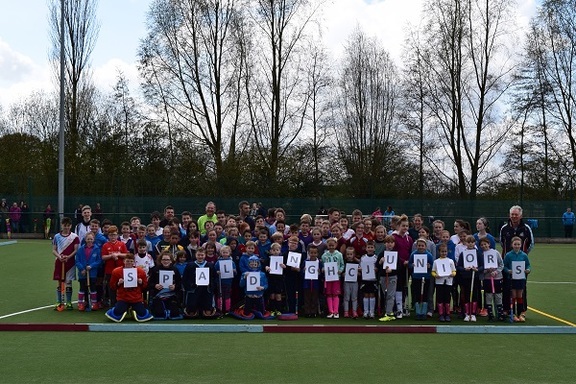 Spalding Hockey Club plays all of its hockey on the excellent floodlit all weather pitch at Glen Park, Station Road, Surfleet PE11 4DB which is situated just behind the Surfleet Village Hall. New members of all abilities are most welcome. Matches on Saturdays from 11:00. See fixture list for more details. The spring programme will run weekly until 13th April. All sessions are 9.15 to 10.45 am at Glen Park. The early summer programme will run for four weeks from Saturday 27th April to 18th May 9.30 to 11.00 am. Sticks are provided, players need suitable footwear, shinpads and a gumshield. Sessions cost £3.50 per week with termly offers available (£10 for the 4 week early summer programme). Sessions will be held weekly on Friday evenings 6.00 to 7.30pm at Glen Park starting 1st March 2019. An ideal for adult beginners and those returning to hockey to join our regular members in friendly matches.